Rahul Dravid: End of Dravid's ODI career? End of Dravid's ODI career? It looks a bit different story.India will be playing without their Wall,Rahul Dravid.After the decision of selectors to drop Dravid from ODIs,there is a big question on Dravid's ODI career.The selectors have given the youngsters full opportuinity to show their quality. 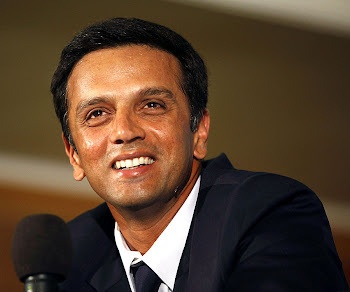 Dravid was first dropped from ODI team when he was unable to score against Aussies in India.He was not considered for next series against Pakistan.That time it looked like he was given rest just to find his form back.He played superbly against Mumbai to score 214 runs in Ranji trophy.It was now upto the selectors to give justice to him,but that has not happened.He has been dropped again for the big Triseries including Srilanka and Australia. After going through the events that occured in last few months,it looks that the doors to the ODI squad have been shut for Dravid.Selectors are showing full faith in youngsters and trying to build new,young Team India.This idea doesn't look very bad.But,it is sure that Team India will miss Dravid a lot.It is not a "one minute task" to find a player like him (there are a few players similar to Dravid like Raina,Kaif etc. but not like him). Well, you say RAINA is like RD? I totally disagree. He has failed to prove himself on a fair given chances.Are the selectors looking for a good knock from him outside home, that too - in AUSTRALIA. Stupid! Suresh Raina is now rocking the Asia Cup tournament. The runs coming off his bat - true but still in the sub-continent..I'd appreciate his commendable performance in this series though. You are right Aashish.He must perform well under the testing conditions (i.e in New Zealand,England,Australia and South Africa). I WANNA SEE RAHUL BACK IN THE ODI SQUAD AGAIN!! PLEASE SELECTORS GIVE HIM ANOTHER CHANCE!! !